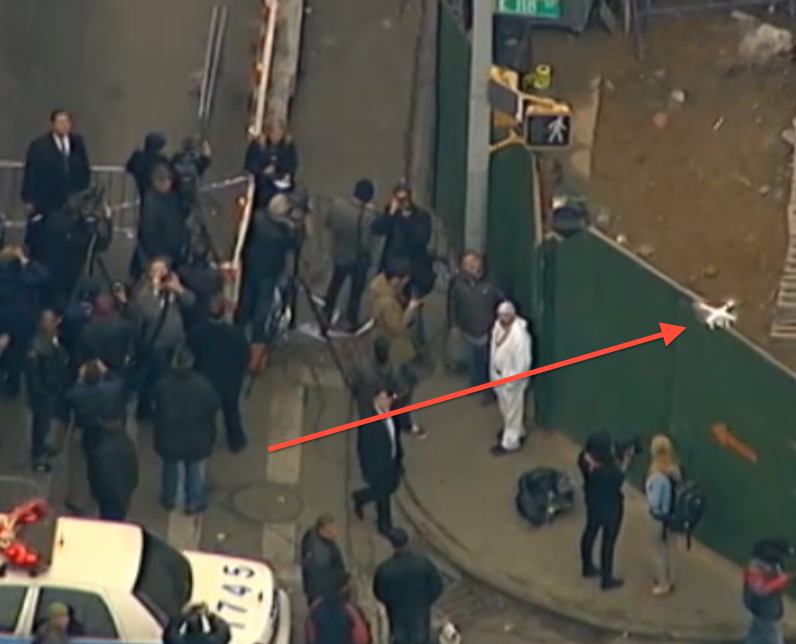 The drone’s owner, 45-year-old Brian Wilson, told the New York Daily News that he normally uses the Phantom II to film real estate or sports events, and that this was the first time he had filmed breaking news. He claims to have launched the drone after receiving permission from the NYPD, and then landed it after the battery depleted; he added the police told him not to fly it anymore. 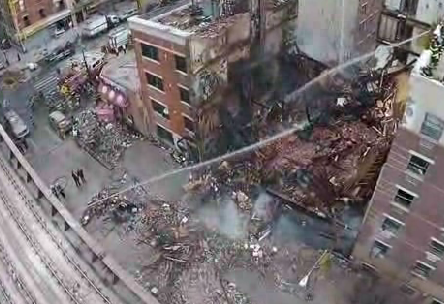 Wilson’s decision to launch the drone is an excellent example of both the drawbacks and the benefits of this new technology: on one hand, drones are an excellent source of news reporting (and possible clues) about events like the explosion but, on the other hand, it could represent a new danger or distraction to emergency responders and the public. As my colleague Signe Brewster predicted after she flew a Phantom II around San Francisco in December, “Consumer drones are coming, and they will change everything.” Now, it appears they really are here and we will have to decide what to do about them. Right now, the Federal Aviation Agency has clear authority to regulate the airspace around airports and the lanes where commercial jets fly. In most other areas, however, the airspace below 400 or 700 feet appears to be fair game because the agency has not passed any formal regulations covering this space. This interpretation of the law got a huge boost last week, when a judge struck down the FAA’s attempt to fine a drone photographer $10,000. The judge rejected the agency’s attempt to invoke its own guidelines, which say that some hobby flying is ok, but that commercial use is not, on the grounds these do not count as law. Commercial drone pilots and many in the tech press responded to the ruling with jubilation, suggesting it provides a green light for a range of drone-related business applications — from farming to surveying to security. The FAA, however, is appealing the judge’s decision and claims the appeal means the ruling has no force for now. The agency has also published a flurry of statements to assert its authority over airspace, including a series of “myth-busting” claims. The latest of these, published last week, declares that the FAA does have full regulatory authority over low-level airspace and that is equipped to carry out enforcement actions (reports have suggested otherwise). At the same time, the Department of Transportation has also suggested that it will try to flex its power over drones. In the meantime, as the government scrambles to get on the top of the issue, drone enthusiasts continue to test limits. A Detroit flower service, for instance, has said it will re-launch drone delivery after the FAA grounded its Valentine Day service. This is entirely Horse Pucky. I do belive there should be regulations for RC air vehicles because of safety reasons….. just like you have city ordinances that prohibit kids from skateboarding on busy downtown sidewalks… so they don’t knock people over, injure themselves or others and break things in their way…. local law enforcement should be able to TICKET you for wreckless behavior… I.E. flying a RC drone within certain short distance of people (FEET, not yards). BUT the FAA’s involvement in this is completely B.S. and should be limited in low airspace control. Why?? because this is all just another way to regulate REVENUE…. not safety. Somewhere on a forum relating to this it was stated the FAA might require a pilots liscense, or an endorsement to a pilots liscense to operate drones commercially. In other words, im going to pay upwards of 50-80+ thousand dollars for a pilots liscense in order to be allowed make money flying a 2ft, 3lb, plastic camera…. at less than 300 meters range that even if it did crash is unlikely to cause major property damage or even major injury for that matter???? SCREW YOU F.A.A. as for your security risk theorys…. you can throw that out the window too… in what universe does it even make sense…. i mean, if anyone is going to mis-use and abuse drone technology, its going to be the HOBBYISTS….. NOT legitimate commercial users who make a living with these tools. and anyone else that’s going to use them in illegal manners IS going to do so ANYWAY… regardless of your commercial restrictions… so FAA needs to spend their time coming up with regulations to deal with the ones that DO bad things with these tools, and not try to find ways to capitalize on the people that use these for making a living and building our economy. And this is completely legal because it dosent have a camera… nonsense…. http://www.youtube.com/watch?v=qQ9dSrrBN28. To be fair, that video is outside of the US. On exactly what do we base this statement: â€œit could represent a new danger or distraction to emergency responders and the publicâ€? There is zero evidence to support that speculation–other than to accept the FAAâ€™s specious notion that UAVâ€™s need to be regulated and controlled, so that when they deem necessary, they can clear any airspace they wish to. The many news helicopters hovering at the scene for hours represented no apparent threat or â€œdistractionâ€ to emergency responders or the public. The reality is that the fight over camera â€œdronesâ€ for newsgathering purposes is much more of PR and political turf battle than any actual legitimate public safety policy. The real loser in the fight will likely be the publicâ€™s right to know (or see) what is really going on. That’s a good point, kirkvarner: it’s hard to complain about a 3-pound UAV when there’s a massive news helicopter hovering just above.. And you’re right that the UAV captured much better footage. It’s going to be a huge issue to decide who will have the rights to use UAV’s at breaking news scenes. In theory, there’s no reason why ABC has a better claim than the Harlem amateur — but I doubt it’s going to work out that way. I agree with kirk, the thundering helicopters pose dangers like this http://www.youtube.com/watch?v=sbGOBgtdfHI Regulation is a way for big business to keep cost as a barrier to entry. the rest is hyped nonsense. I only think they will be distracting until they become more common place in situations like this. Its a safe way of getting intelligence on the situation they are covering.